If your baby cries in front of strangers, even if those strangers are just people he or she doesn’t see often (like grandma and grandpa, or aunties and uncles), you are not alone. This question thread, and others, will clearly show it happens to lots of parents. It can be embarrassing, and at times, it can keep you away from crowds. That can make it tough to attend your usual social events, even if babies are welcome at them. And, when it comes to daycare, it can be hard to think: what will I do when I leave my child with caregivers? Will my baby cry at daycare? Should I be concerned that my baby has stranger anxiety? It’s a heartbreaking prospect, we know. However, as we mentioned above, you are not alone. Let’s discuss some strategies for helping you and your baby get through stranger anxiety. A baby that cries with strangers is one that can recognize faces. So that’s a good thing. And this instinct is what helps them know who to trust, and who takes care of them. The fact that your baby is not crying with you means they love you, trust you and know who you are. When your baby cries around strangers, they have the sense that they may no longer be safe. They are guarding themselves, and instinctively trying to go back to that ‘safe zone.’ So if you think about it, this is healthy, and expected. In fact, multiple sources will say it’s part of normal baby development. Babies are taking in a lot. Remember that the world is brand new to them. If your baby has stranger anxiety, and if he or she cries around strangers, you’ll want to mindful of too much activity. If your baby is overstimulated, he or she can get cranky, and the separation anxiety can be worse. But this overstimulation in babies does not only happen around people, and not only with stranger anxiety. It can happen during play time too. These are called “disengagement cues” and it’s helpful as a parent to watch out for them. They can be your baby’s way of communicating with you. You can help train your baby to overcome stranger anxiety. Try introducing more caregivers into his or her life. Perhaps take a break by being away for a few hours. You could probably use the break anyway. And if you’re overly anxious, why not try being in the next room, where baby can’t see you. That way, you can still jump in if it’s really too hard to listen to the wailing, or if the wailing won’t calm down after a short while. Give it practice, and repeat as necessary. The other thing you can do if your baby cries in front of strangers, is show him or her that you’re totally ok with that ‘stranger’ nearby. As this resource says, you can ask the stranger to be slow and gentle. Then let the stranger play with the baby, but only while you hold him or her. Then progress to other stages. Let your baby stare at them for a while, it’s ok! Another article by a doctor encourages that you act totally calm if you see someone you know, but that baby doesn’t know. Your baby will be sizing up that stranger based on your reaction. Remember – they are learning who to trust. Eventually, you can ask the stranger to play with your baby using a toy that may attract their interest. So take it easy. If there are too many people at an event, try to move to another room where there are fewer people. Help your baby get used to being in crowds by starting in small, quiet spaces. Perhaps a parent group would be a good first start, as they’re usually in the same boat, and would be able to understand easier, and help. The tough part will be working up to the point of going to daycare, especially at a young age when baby has already learned he is not one with you, and he might not be able to have access to you anymore. In an article linked to above, we learn that abruptly leaving when your baby is distracted is probably not best. Instead, show up early to daycare and take the time your baby needs to understand that you are leaving. Yes, they might still cry, but they will likely get used to it. Eventually, especially as they grow, your baby will retain a memory to know that you do in fact come back for them. Their separation anxiety tantrums will lessen. If you’re at a professional daycare, the child care workers will also be skilled at helping your baby eventually have a great time while you’re away. A crying baby is probably nothing new for them, so don’t worry that they may be having a hard time! All in all, know that there is nothing abnormal about your baby having separation anxiety or stranger anxiety. It’s instinctive, and it’s part of their growing up. 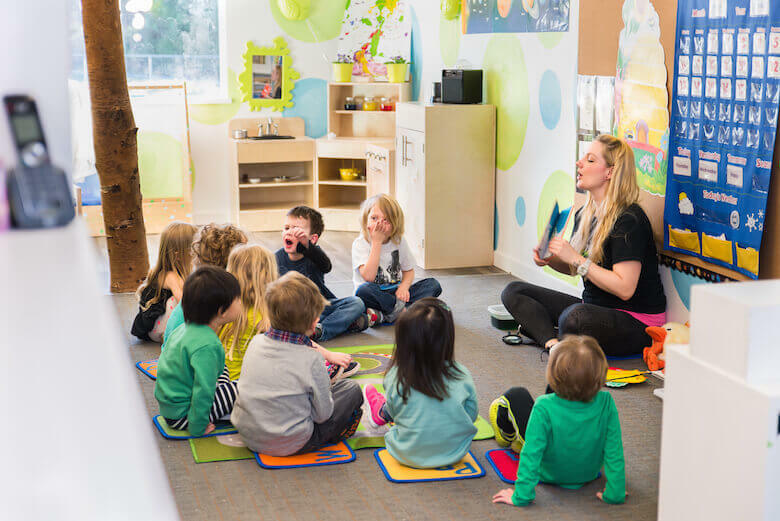 A daycare with qualified early childcare workers, or early childhood educators will be able to help you transition through the stranger anxiety phase.